In the advent of Black 2 and White 2, TPC has once again come up with another opening for Best Wishes Shizun 2. But let’s move on. As the date nears for black 2 and white 2, I might as well show you guys some of the aesthetics the game has to offer come October. The opening is drastically different from the one in Black and White, now featuring the new game characters, the Tao trio and the legendary musketeers. Also, the title screen shows either Black Kyurem or White Kyurem, depending on the version. The bar that shows a Pokémon’s level, Exp. Points and HP has been redesigned. It is black in Black 2 and white in White 2. The area eyecatch has also been redesigned and shows the location in the top left of the screen and season in the bottom right. It is black in Black 2 and white in White 2. New locations, such as Aspertia City and Sangi Town, have been added to the game. New characters are introduced, such as Hugh, Colress, Roxie, Marlon and Banjirou. All Unova gyms receive redesigns. Every trainer has their own fully animated sprite. The battle menu has seen a redesign. All returning Gym Leaders and Champions receive new sprites. Victory Road changed drastically from Black and White to Black 2 and White 2 as well and differs in appearance between Black 2 and White 2. Challenger’s Cave‘s entrance collapsed while Route 10 was locked off due to landslide on Victory Road, making both areas inaccessible. In place of Cold Storage there is now the Pokémon World Tournament. So there you have it, something to look forward to this fall. Now, onto pressing matters, a giant list of boring anime for the summer. 2. Kono Naka ni Hitori, Imouto ga Iru! See also the most anticipated anime of summer 2012 – amazingly only 3 anime from there feature in this list, although again this could merely be because nobody had high hopes for them in the first place. 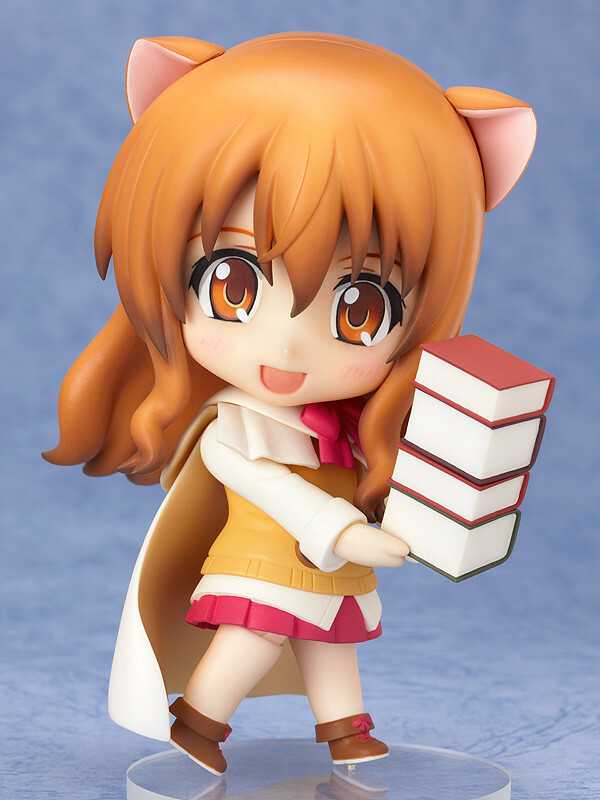 The little genius Riccotta Elmar from Dog Days gets a Nendoroid set for release in November 2012, by Good Smile Company. And now we talk about the first woman who went to spehz. HOUSTON — Sally Ride, who blazed trails into orbit as the first American woman in space, died Monday of pancreatic cancer. She was 61. “Sally was a national hero and a powerful role model. She inspired generations of young girls to reach for the stars,” President Barack Obama said in a statement. “The nation has lost one of its finest leaders, teachers and explorers,” he said in a statement. She also was on the president’s committee of science advisers. “But in another sense, it’s rewarding because it’s an opportunity to be part of the solution and part of the changes that will occur and will make the program better,” she said. It was all work on that first flight, except for a first-in-space sprint around the inside of the shuttle, Thagard recalled by phone on Monday. He didn’t know who won. One of Ride’s last legacies was allowing middle school students to take their own pictures of the moon using cameras aboard NASA’s twin Grail spacecraft in a project spearheaded by her company. “Sally literally could have done anything with her life. She decided to devote her life to education and to inspiring young people. To me, that’s such a powerful thing. It’s extraordinarily admirable,” said Maria Zuber, a professor at the Massachusetts Institute of Technology who heads the Grail mission. Ride’s office said she is survived by Tam O’Shaughnessy, her partner of 27 years; her mother, Joyce; her sister, Bear, a niece and a nephew. And let’s not forget about those idiot’s in the US. A Sylvan Beach man who was allegedly using his cell phone while driving was injured Sunday after he drove into an oncoming car on state Route 69 in Annsville, the Oneida County Sheriff’s Office said. Andrew Bonomo, 21, turned left from Main Street onto Route 69 just before the accident, but turned into the wrong lane and proceeded to drive east in the westbound lane, deputies said. The driver of an oncoming car, 47-year-old Luke Pomilio of Rome, attempted to drive onto the shoulder to avoid a collision with Bonomo’s car, but Bonomo reportedly continued steering toward the other vehicle, according to witnesses, resulting in a head-on crash, deputies said. Bonomo was taken to Rome Memorial Hospital with injuries. He also was ticketed for failing to keep right, using a cell phone while driving and other traffic charges, deputies said. He will appear in Annsville Town Court at a later date. The Taberg Fire Department and state police assisted at the scene. And let’s not forget, Asia’s billionaires. (CNN) — For the first time, the Asia-Pacific region has become home to the highest number of millionaires in the world, according to an annual global wealth report by Capgemini and Royal Bank of Canada Wealth Management. Asia-Pacific surpassed North America in 2011 to have 3.37 million high-net-worth individuals (HNWI), which the report defined as people with at least US$ 1 million available for investment, excluding personal assets such as primary homes, collectibles, and consumer durables. North America was a close second with 3.35 million HNWIs, although the region still led with the highest amount of investable wealth at US $11.4 trillion, compared to Asia-Pacific’s US $10.7 trillion. Despite the reshuffling, investable wealth fell across all regions, except the Middle East, due to HNWI investments in risky, less liquid assets amid high volatility in global markets. The overall 1.7% decline was the first recorded since the 2008 financial crisis. At 11 million, the worldwide number of HNWIs only increased by 0.8%. China accounted for about half the increase of HWNIs in the Asia-Pacific, where the super-rich increased 5.2% to 562,000 people—placing the country in fourth place behind the U.S., Japan, and Germany. On the other hand, Hong Kong and India were the worst-hit, falling 17.4% and 18%, respectively. Singapore and South Korea also saw falling number of HNWIs. The 16th World Wealth Report, which assessed economic activity in 2011, covered 71 countries that account for more than 98% of gross national income. Gun violence has no borders — as evidenced in recent weeks with mass shootings in Toronto and Colorado — but laws in Canada and the U.S. differ, prompting at least one Ontario lawyer to say “cultural difference” is the best defence for Americans caught with weapons. Greg Goulin, a defence lawyer in Windsor, Ont., represents Americans caught with restricted and prohibited weapons when they cross into Canada. He said the best defence is to claim cultural differences. “Saying ‘I forgot’ doesn’t sell too well in our court system. [We think], ‘How can you forget you had a loaded handgun in your car?’” Goulin said. He called loaded handguns “very frequent” in the U.S. and “standard additional equipment” in homes and cars. “To me, the cultural difference is so very obvious,” Goulin said. Goulin represented one person who was shot and then, after a lengthy recovery in hospital, was robbed at gunpoint. “He wasn’t going to be parted from his gun,” Goulin said. “You have a certain degree of appreciation if you understand the violent culture they come from. Under the recently passed omnibus crime bill, the penalty for being caught bringing a handgun into Canada is a three-year minimum jail sentence. “The Crown attorney’s office has a degree of discretion. Should the person have a reasonable explanation for their error and are willing to admit culpability in the matter, that minimum penalty can be reduced at the discretion of the Crown,” Goulin said. Signs do notify American visitors to Canada handguns are prohibited. Goulin said they don’t work all the time. “When you come into the [Detroit-Windsor] tunnel, there’s very little time for you to see a sign. When you come to the [Ambassador] bridge, there’s such a confusing set of signs to get to the bridge, I imagine a driver’s attention is drawn elsewhere,” Goulin said, referencing ongoing construction there. “The point is, [Americans] come there, they’re asked at the border, they appreciate they have a gun and still say no. Why? Why say no?” Goulin said. That’s all for tonight folks, g’nite everybody.